Vaughan was an historian, born at Penmorfa, Llangoedmore in Cardiganshire in Wales. Historical writings include, From Anne to Victoria; Studies in the Italian Renaissance; The church in Wales from the Reformation to the present day; The Medici Popes; and The Last Stuart Queen. He was author, as well, of a great amount of other miscellaneous writings including poetry, travel writing, essays, fantasy fiction and reviews. He was educated at Clifton and Keble College, Oxford. Vaughan had a special interest in Italy and wrote a number of articles on Italy for London magazines as well as books on Italian art and history. He resided for a time in both Florence and Naples. He published (Methuen & Co., London) The Naples Riviera in 1907. 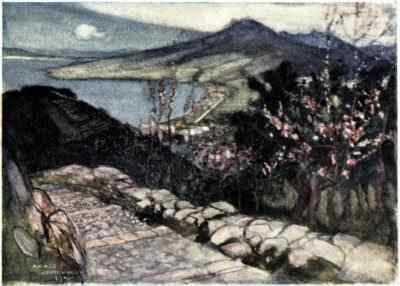 Illustration: Vesuviusand the Bay of Naples by Maurice Greiffenhagen(1862-1931), one of most esteemed illustrators of his day. It is one of 25 such illustrations that adorn The Naples Riviera. The fact that colored illustrations appeared in a book published in1907 is remarkable. "The Riviera of Naples," says Vaughan "may be said to extend from the heights of Cumae, at the end of the Bay of Gaeta to the north, as far as Salerno in a southerly direction, whilst, lying close to this stretch of shore, are included the three populous islands of Capri, Procida and Ischia...Our pleasant task it is to write of these classic shores and islands, where the beauties of nature contend for pre-eminence with the glorious traditions of the past that centre round them." The book contains among its many chapters, one on Mt. Vesuvius, a lengthy, well-researched general history of the volcano from ancient times up to the present. The passage below is noteworthy because it details the most recent eruption at the time (1906), which occurred just as The Naples Riviera was being prepared for publication. Here below follows the general chapter on Vesuvius. Scarcely had the above pages been written, than the Mountain, which had been drowsing for more than thirty years, suddenly awakened to give appalling evidence of its latent activity and powers of mischief. The eruption of April 1906 has, in fact, surpassed all previous outbursts within living memory, and it may probably be reckoned amongst the most violent of all hitherto recorded. Many of the details of this event doubtless remain fresh in the memory, and in any case the sad condition of numerous towns and villages, and of the beautiful Vesuvian districts, the paesi ridenti [ed. note: laughing towns] as the Neapolitans affectionately term these fertile lands, will serve for some years to come as a sinister and ever-present reminder of the horrors of the past and of the dread possibilities of the future. All vegetation for miles around the volcano has been injured or destroyed, for not only was the Mountain itself covered deep with grit and ashes, but the streets and gardens of Naples, the luxuriant plain of Sorrento, and even the heights of Capri, twenty miles distant across the Bay, were shrouded in a funereal mantle of the greyish-yellow dust that Vesuvius had flung into the air to let fall like a shower of parching and destructive rain upon the earth. How vast was the amount of matter ejected from the crater and scattered in this form over the surrounding country, we may judge from the scientific calculation that 315,000 tons fell in Naples alone! Everywhere appeared the same scenes of desolation, the same dreary tint, for so thickly had this aerial torrent of ashes descended, that buildings, trees and plants were completely hidden by it, the whole landscape suggesting the idea of a recent heavy fall of dirty-coloured snow. Paesi ridenti, indeed! It was a land of ugliness and mourning, a city of stifling air and of human terror. A few days previous to the eruption, which began on April 5th, the island of Ustica, which lies some forty miles north of Palermo, had been visited by earthquake shocks of such violence that the Italian Government at last decided to remove the greater part of its population to the mainland, as well as the convicts attached to the penal settlements on the island. Scarcely had these manifestations ceased at Ustica, than Vesuvius began to show signs of increased activity; the supplies in the wells on the mountain sides began to fail, and there was observed a strong taste of sulphur in the drinking water; whilst—most dreaded phenomenon of all—the ever-active crater of Stromboli, that lies midway between Naples and Messina, suddenly lapsed into quiescence. We all know the subsequent story of the outbreak; of the thousands of fugitives flying into Naples or other places of refuge; of the utter destruction of houses and cultivated lands;—the doleful scenes of a Vesuvian eruption have been enacted and described time after time in the history of the Mountain, and there is every reason to suppose they will be repeated at intervals for centuries to come. The marvel is how human beings can calmly settle down and pass their lives so close to the jaws of the fire-spouting monster, and why an intelligent Government permits its subjects to dwell in places which are ever exposed to catastrophes such as that which we have just witnessed. Well, it is the natural temperament of the Vesuviani to be fatalistic, despite their religious fervour; and acts of legislature cannot force them to abandon their old deep-rooted notions; all that the Italian Government can do therefore is to stand ready prepared to help, when the upheaval does occur, as it inevitably must. It is always a matter of speculation on these occasions as to what course the ejected lava will pursue; whose turn, of the many settlements on the southern slopes of the Mountain, will it be to suffer? This time it was Bosco-Trecase, a village above Torre Annunziata, that was devastated by the sinuous masses of incandescent matter, high as a house and broad as a river. Torre Annunziata itself, as also ruined Pompeii were threatened, but the red-hot streams of destruction mercifully stopped short of their expected prey. The story of horrors and panic in the overthrow of Bosco-Trecase is happily relieved by many a recorded incident of valour and unselfishness. The royal Carabinieri, that splendid body of mounted police, who in their cocked hats and voluminous cloaks appear as ornamental in times of quiet as they prove themselves useful in the stormy hours of peril, acquitted themselves, as usual, like heroes. It was they who guided away the trembling peasants before the advance of the lava, searching the doomed houses for sick and crippled, whom they carried on their shoulders to places of security. Working, too, with almost equal zeal and practical good sense were the Italian soldiers, who richly deserved the praise that their royal commander, the Duke of Aosta, subsequently bestowed upon them for their invaluable services rendered during these fearful days of darkness and danger. “Soldiers!” declared the Duke, in his address to the troops on April 23rd, “I have seen you calm and happy in the work of alleviating the misfortunes of others, and I put on record the praise you have won. By promptly appearing at the places distressed by the eruption, you have encouraged the people by your presence and your example; you have maintained order and have safe-guarded property. Helping the local authorities, and even in some instances filling their offices, you have carried out the most urgent and dangerous duties in order to save the houses and to keep clear the roads. In the spots most heavily afflicted you have lent your assistance in removing and caring for the injured, and in searching for and burying the dead you have given proofs of great self-sacrifice and reverence (pietà). Not a few of the refugees have obtained food and shelter in your barracks, and whole communities without means of existence have been provided by you with the necessaries of life. Everywhere and from all your conduct has gained you loud applause. Nevertheless, your task is not yet ended; continue at it out of love for your country and devotion to your King! With such a reputation for kindness of heart and energy in time of need, no wonder that the Army is popular with all classes in Italy! Nor did the King and Queen hold aloof from the scene of disaster, for they hurried from Rome at midnight of that terrible Palm Sunday on purpose to comfort the terror-stricken population. Victor-Emmanuel even penetrated in his motor-car as far as Torre Annunziata, in spite of the fumes of sulphur and the many difficulties in proceeding along roads clogged deep with volcanic dust and ashes. On another occasion the King and Queen paid a visit to the afflicted district of the slopes of Monte Somma, where Ottajano and San Giuseppe had been almost buried by the continuous falling of burning material from the crater. In fact, these localities suffered even more severely than the towns on the seaward face of the Mountain (Bosco-Trecase excepted), and at Ottajano hardly a house in the place remained intact at the close of the eruption, whilst the loss of human life was probably higher here than elsewhere. The Duke and Duchess of Aosta—he the king’s cousin, and she the popular Princess Hélène, daughter of the late Comte de Paris—were likewise indefatigable in their efforts to assist and reassure the demoralized population, and to make every possible arrangement for the feeding and housing of the numberless refugees and the tending of the injured in the hospitals of Naples. Equally valorous was the conduct of the great scientist, Professor Matteucci, who remained together with a few Carabinieri throughout all phases of the eruption at the Vesuvian Observatory, although in imminent peril of death amidst a deadly atmosphere of heat and sulphureous fumes. It was on April 5th that the streams of burning lava first burst from the riven crater and made their way down the south-eastern slopes, destroying Bosco-Trecase and reaching to the very suburbs of Torre Annunziata. Pompeii itself was imperilled, and it is always well to remember that during an eruption this precious relic of antiquity may possibly be lost to the world. Meanwhile the rain of ashes and mud—formed by dust and hot water commingling—fell incessantly; 150,000 inhabitants of the Vesuvian districts fled in precipitate flight towards Naples, towards the shore, towards the hill country beyond the Sarno. It was truly a marvellous spectacle to observe the relentless stream of burning lava crushing irresistibly every opposing object in its fatal path. Onlookers at a distance could perceive the walls of houses bulging outward under pressure of the moving mass, until the roof collapsed in an avalanche of tiles upon the ground, whilst with a final crash the whole structure—cottage, farm, church or stately villa—succumbed to the overwhelming weight. Many are the tales of courage and intrepidity; not a few, alas! are the stories of folly and cowardice that are related in connection with the eruption. It cannot be said that the population of Naples, where everybody was perfectly safe even if the atmosphere was unpleasant and the distant thunders of the Mountain reverberated alarmingly, comported itself with dignity or calm; and this criticism applies in particular to the hundreds of visitors—English, German, American and other forestieri—who besieged the railway station in frantic and indecent anxiety to remove themselves with all speed from the city. Some excuse might perhaps be found for the hysterical terror of the poor inhabitants of the Mergellina or the Mercato, who spent their time in wailing within the churches or in screaming for the public exhibition of the venerated relics of their patron Saint, which again on this occasion the Archbishop, nolens volens, was compelled by the mob to produce. But for the great mass of educated foreigners then filling the hotels and pensions of the place, it cannot be said that their conduct was edifying, particularly in face of the example set by the King and Queen of Italy. To add to the general panic prevailing in the city, the Neapolitans themselves were not unnaturally greatly exasperated by the serious accident which took place at the Central Market Hall near Monte Oliveto in the heart of the old town. Here, early one morning during the course of the eruption, the great roof of corrugated iron collapsed, killing many and frightening the whole of the populace, already sufficiently unnerved by recent events. That this catastrophe was due to the casual methods, amounting in this case to criminal neglect of plain duty, of the municipal authorities, who had neglected to sweep the accumulation of heavy volcanic ash from off the thin metal roof, none can deny; and this glaring example of public stupidity had of course a bad effect on the demoralized multitude, which threatened to grow unruly, as well as terrified. No, the graceless stampede of educated foreigners to the railway-station, the incompetence of the Municipality, and the behaviour of the Neapolitan crowd do not appear very creditable to the supposed enlightenment of the twentieth century. It had been confidently predicted that nearly fifty years of State education and liberal government would work wonders in dispelling the crass ignorance and the deep-seated superstition of the dwellers on the Bay of Naples. Yet, so far as can be judged from recent events, matters seem to have changed but little on these shores, for the mass of the population evidently preferred to pin its hope of safety to the miracle-working relics of San Gennaro, rather than to the reassuring messages of Professor Matteucci, sent from his post of undoubted peril on the mountain-side. If the inhabitants of a great city, which was never seriously threatened with danger, should have acted thus, there is undoubtedly much excuse to be found for the Vesuviani themselves, whose houses and lives were certainly in danger from the devastating streams of lava. It was with a sigh and a smile that we learned how the good people of Portici attributed their escape from the fate of Bosco-Trecase to the direct interposition of a wonder-working Madonna enshrined in one of their own churches. For some days the town had been threatened, so that many were convinced of its impending doom, when happily at the last moment the expected fate was averted, as though by a miracle. And miracle it truly was in the eyes of the people of Portici, when it was observed that the snow-white hands of their popular Madonna had turned black in some mysterious manner during the night hours. What could be a simpler or easier deduction from this circumstance, than that Our Lady’s Effigy, taking pity on its affrighted suppliants, had with its own hands pushed back the advancing mass of lava, and thus saved the town! Great was the joy, and equally great the gratitude, displayed by these poor souls at Portici, who at once organised a triumphal procession in honour of their prescient patroness “delle mani nere.” [ed.note: of the black hands] Does not such an incident, we ask, lend a touch of picturesque medievalism to a modern scene of horror and darkness, exhibiting to us, as it does, the traits of a simple touching faith and of genuine human thankfulness?